Brookings recently hosted an event on the future of the U.S. space program featuring several panels of experts to discuss a variety of topics. But this isn’t the first time Brookings has focused on space policy, both recently and over 50 years ago. Brookings scholars have conducted research on space policy in the recent past, including “Launch! Taking Colorado’s Space Economy to the Next Level,” a report by the Metropolitan Policy Program; and Michael O’Hanlon’s 2004 book Neither Star Wars nor Sanctuary: Constraining the Military Uses of Space. The table of contents below (click to enlarge) shows attention in the 186-page (Brookings Library version, before the appendices) report to a wide-range of policy issues, including communications systems, “weather predicting system,” space industries, and implications for foreign policy. is the potential for unexpected and important effects on society, since no technology or object of technology operates by itself in generating its effects. In many cases, utilization of the technology is almost totally dependent on other non-technological factors in the society. 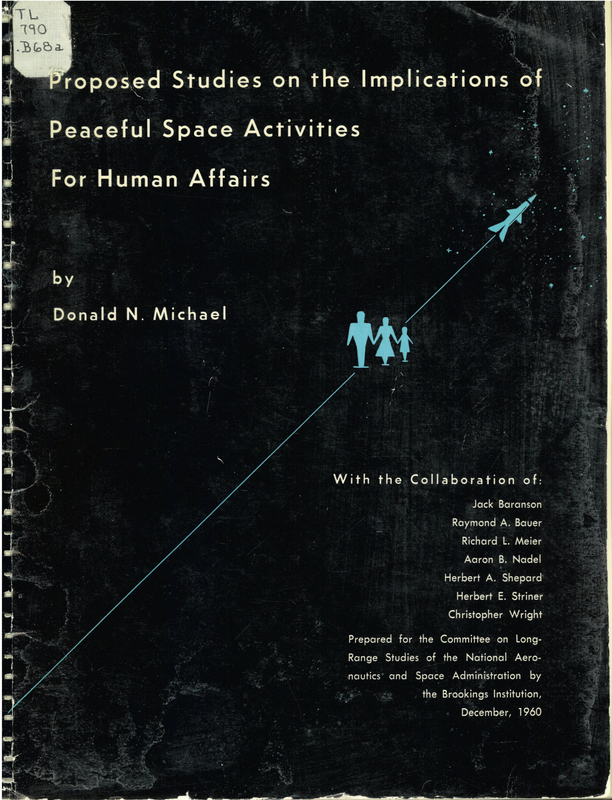 In this section, the report covered business executives (“the impact of recent technological advances appears to have made executives extremely reluctant to conclude that anything is impossible”); children (“their childhood impressions of space and its implications may have strong effects on their career choices and adult attitudes toward space activities”); and the general public (“How important are expectations of imminent and glamorous space activities to public support of the effort and the allocation of funds and resources to it?”). A discovery of extraterrestrial life, most likely through radio contact the authors believed, “would certainly be front-page news everywhere” and “might lead to a greater unity of men on earth, based on the ‘oneness’ of man …” or, due to the tremendous time lag in communications, “the fact that such beings existed might become simply one of the facts of life but probably not one calling for action.” The report recommended continuing studies “to determine emotional and intellectual understanding and attitudes” regarding the possibility of intelligent extraterrestrial life” and studies to understand “the behavior of peoples and their leaders when confronted with dramatic and unfamiliar events or social pressures.” The latter aimed to determine how such information might be shared, or withheld, from the public. Read this section of the report here (PDF). it will only be a prelude to attempts to put man on the moon and some of the planets. Thus the implications of astronautic efforts, subsequent to Mercury, for attitudes and values should also be studied. Social observers have speculated that manned flight to the moon or Mars might restimulate the American frontier spirit, thereby supplying a new form of vicarious living for a large part of the public and perhaps inspiring some to participate in more challenging activities here on earth. The U.S. House Committee on Science and Astronautics (87th Congress) reprinted the report in a committee print, available here.